We use traditional stone mills combined with modern cleaning equipment to produce our flours. Our stone grinding process permits less heating of the grains thus allowing them to retain all their natural nutrients. We do not take anything out off or put anything into our flour. It is completely 100% Whole Grain. Don't just take our word for it, our Wheat and Corn flours have been certified whole grain by the Whole Grains Council. Our Wheat flour has been certified to carry the Health Check Stamp in Canada. Most processes separate parts of the grain and then artificially add nutrients back into the flour. Our process ensures that you get the complete benefit of eating a whole grain product. There are no additives or preservatives in our flours. Grains are the kernels of certain plants. 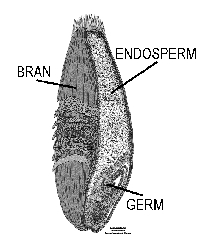 The kernels are made up of three parts: the bran, endosperm and the germ. To be considered Whole Grain all three parts of the kernel must be present. These three parts contain valuable nutrients that play an important role in our diets. As part of a balanced diet, Whole Grains have been shown to reduce the risk of heart disease by decreasing cholesterol levels, blood pressure, and blood coagulation. Whole Grains have been found to reduce the risks of many types of cancer and help regulate blood glucose in people living with diabetes.